It remains to be seen how the process of today’s Euro 2012 draw will be structured, although we can assume it will be convoluted and drawn-out – certainly with long speeches and explanations, and possibly cultural dances from the two host countries. Often, the first draw involves deciding which groups the seeds go into – A, B, C or D – before determining which sides anyone will actually play. As it happens, this time around Poland have already been assigned to group A, whilst fellow hosts Ukraine have been placed in group D.
But is that true? There is surely a clear advantage (whether or not you’re the seeds) from being in Group A rather than in Group D. For this tournament, a side in Group A that progresses to the final will play six times in 24 days – for a side in Group D, it will be six times in 21 days. In modern football, when players are frequently rested to give them extra time to recover for more important games, and when there’s a feeling that being in the Europa League significantly harms a side’s performance in the following league game, a difference of three days might be crucial. Of course, the obvious counter-argument is that a side in Group D has extra time to prepare for the tournament, which is certainly true. But then, so will that team’s group opponents, so it’s no real advantage. Besides, whenever a player is interviewed before his first game of the tournament, he almost always speaks of the frustration of watching everyone else play whilst sitting around, and is desperate to go out there and get his own campaign underway. 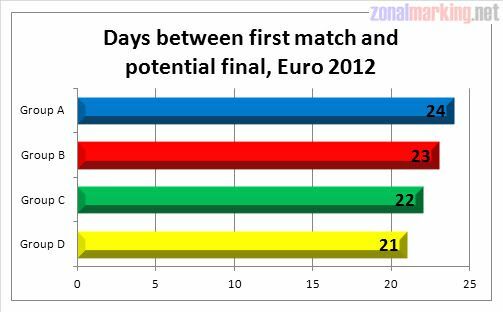 Spain won Euro 2008 despite being in Group D (and did the same in World Cup 2010 from Group H) – which indicates that starting late isn’t a barrier to success. However, there’s too many variables to say that this disproves the theory that going first is better. Because of the structure of this tournament, being drawn in Group A or B will be particularly important at the semi-final stage. The two sides that get to the semis from A and B (they could, of course, be from the same group) will face a side from groups C and D having had two extra days’ rest between the quarter-final and semi-final stage. The first semi-final on the 27th June will be played between a side who played on the 21st against a side who played on the 23rd. Likewise, the second semi-final on the 28th of June will be played between a side who played on the 22nd against a side who played on the 24th. 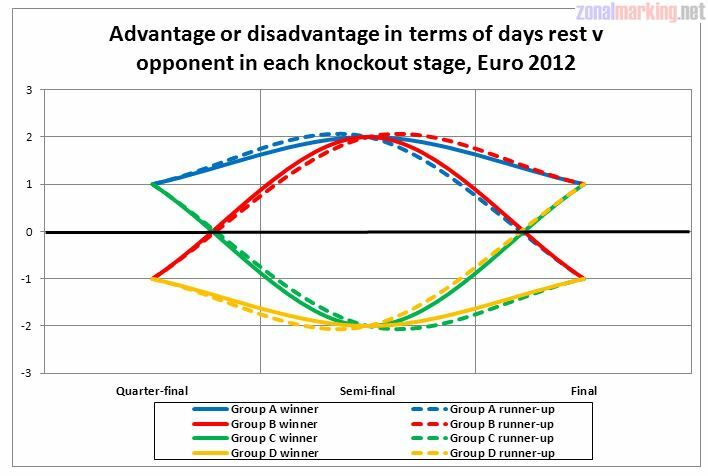 The tournament is structured this way to prevent it being spilt into two halves (which would mean certain combinations of finalists aren’t possible from the start, like in World Cup 2002 or Euro 2008), but two days’ extra rest is a huge difference at that stage. In fact, no knockout games will be held with both sides having had the same amount of time to prepare. 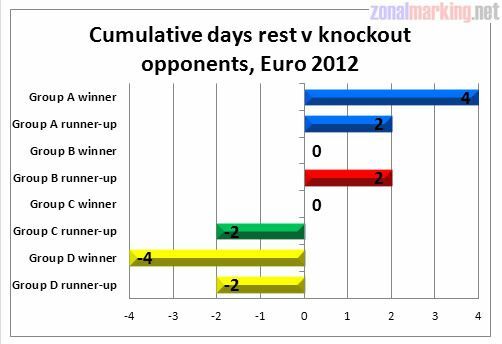 The graph below shows how many days rest each qualifier will have compared to their opponent going into each game. Because of various changes to the structure of the tournament since a 16-team European Championship was introduced in 1996, there have only been two previous matches where a side enjoyed two days more rest than their opponents – the semi-finals of Euro 2004. 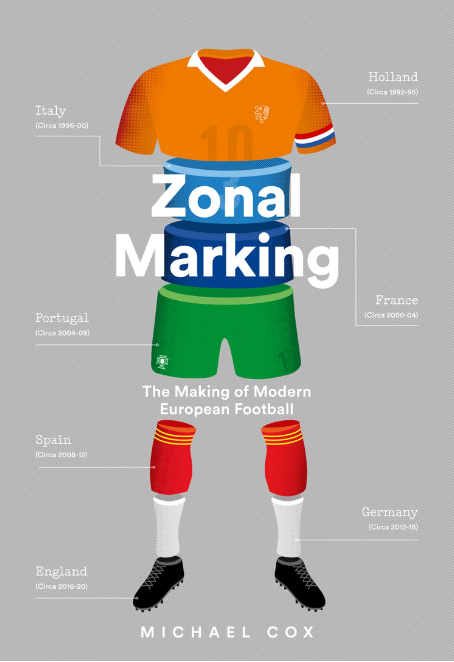 Then, the two sides with more rest, Portugal and Greece, beat the two side with less rest, Holland the Czech Republic. We ended up with a final featuring two sides from Group A. The semi-final stage is where rest will come into play, and there’s an advantage of being in either Group A or Group B. If you win group A, you have, in total, four days rest against your three knockout opponents. If you win Group D, you’re always having to play catch-up. Interesting stuff. The travelling part, though, I found a bit much. Maybe it’s just living in Canada, but travelling 767km by plane is nothing. Maybe an hour and a half start to finish, and takes only marginally more time than the shorter flights. The point was rather more about 1500km v 0km – or even the fact that it’s flying v not flying, really. Also I don’t know if this is relevant, but since the draw has been made, it means effectively 2/8 – 25% of teams in QTR Final will e average or weak. So if group A – B meet in quaters, that’ll mean Germany & Netherlands have assured entry to Semis. Much like how Holland forged their path to the WC final, managing to get Uruguay. I know this is overtly deterministic, but commentators always have a fetish for group of death. Certainly, it is worth talking about. But Group A teams, mean that that least two of these ‘poorer’ sides will be in the quarters. So if Germany and Holland can muster through their group, with a 7 point arrangement like Argentina & Holland at WC, then they have good pickings in quarters. Freud would have a field day with that second chart. I don’t get it. Please explain further, in great detail. The travel stuff is incorrect. Germany for example stays is Gdansk. If they have two games in Donetzk they don’t change quarters. They will travel back and forth twice, quite a bit of travel. Very interesting topic and article! I would of never thought of this affecting National Squads too much until you pointed this out. Thanks! Germany/Netherlands winner is mint. Gets the runner-up of Group A, and the days of rest benefit. It seems like this is a hypothesis that could be tested empirically, using statistics from all Euro and World Cup competitions since, say, 1958 (arguably the start of “contemporary” football.) You could look at all won-loss, goals.for and goals-against records and chart them as a function fo the number of days rest since the previous game, looking only at games where there was a difference of > 24 hours rest between the two opponents. To eliminate other sources of bias, you could do multivariable regression with other relevant factors (distance travelled to game, home country, home continent, pre-tournament FIFA ranking etc) as potential confounders. How about it??? Yeah, but of the few previous results you mentioned there were as many examples for as against the idea that this makes any difference. A very good proof of Group A having more days rest than Group D but with absolutely no conclusions to be drawn about it whatsoever. Hey, I’m just a humble physician and epidemiologist who loves soccer (fútbol). 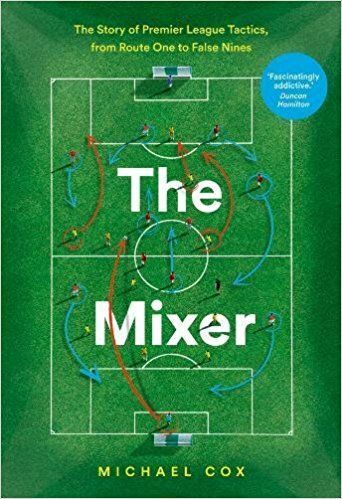 Give a guy a chance to blend his passions . . . .
David, this website might be of interest: http://www.soccerbythenumbers.com Perhaps you could convince him to run the hypothesis? ZM, good points. Each year in the hockey playoffs (NHL) commentators debate the advantage of rest vs momentum, but unfortunately I’ve never seen an article that actually looks at the numbers. Would be interesting to see which is the advantage in hockey (and by that I mean it would be interesting for one of these commentators to actually crunch the numbers). Dismissising such a point on such grounds seems like a cop out, surely one can use the same argumentation to dismiss your own argument. Also, I seem to recall all the teams that qualified from the Euro 2008 group phases with a game to spare (and subsequently rested their players for the final game) went out in the next round. Does this not suggest that, in actual fact, International teams need games to perform? The above point also hints at a disparity between Club and International football which would render your Europa league example void. But despite my qualms, I still am inclined to agree with your conclusion. You’re argument assumes that it is “better” to have an extra few days rest for reasons drawn from club football. I don’t see how this cannot be deemed to be a “historical example”. I also gave a more pertinent example that seemed to disagree with this which is never considered within your article. Now that the draw has been made, one thing that hasn’t really been mentioned is the fact that we (England) will most likely have to win our group, a group that in my opinion contains a superior French side in order to most likely avoid playing Spain in the 1/4 Finals. Still, could have been worse, could have been in group B or C. Why oh why could we not have been in group A !!!! If they come 2nd, they likely get to play Spain. If one reads the caption, it should be obvious that you can’t read it like 8 days. A bit cheating – yes, but only towards someone who is too stupid to be able to correctly read a graph . It seems needlessly cruel to discuss the semi-finals on a blog with so many English readers. Coaches are very astute about this and I am sure they are aware of this discrepancy. Squads that are rotated frequently eg. England, Germany etc. will not suffer the consequences of a shortened rest period. Plus you have over looked the players themselves. Teams that go deep into the CL knockouts will have players who are fatigued. Given the state of English teams as we speak there isn’t much to worry. Based on this analysis and the CL predictions the team that will be fatigued the most is Spain. Don’t forget that Rooney gets to “rest” for the group stage. That’s even less fatigue for the English if they make it to the knockout rounds. I hadn’t realized that could be a positive but I suppose it might be. In any case, English-based players will have more fatigue problems anyway because of the longer season (two domestic cups + league games) and the lack of a winter break. Rotation in the latter stages is pretty rare. Indeed: England’s coach is so “astute” that he is insisting that England will stay in a location (Krakow) almost as close to London as it is to Donetsk, where England will play 2 group games. So now ZM is going beyond tactics? Nice! Pretty soon we’ll be reading about transfer strategies and locker room management. Some people say the temperature difference between Basque Country and Andalucia was a determining factor in 1982. If that’s true then I can’t wait to hear what will be said on the matter in 2014. Fortaleza vs Porto Alegre in June is like Cairo vs Prague in December. On top of that there’s the humidity difference between Manaus (tropical monsoon climate) and Brasília (imagine London’s precipitation index in reverse), for example. And don’t even get me started on the distance teams will have to travel, with some covering over 5 thousand kilometres during the Group Stage alone. Even sides drawn in the same group will have huge differences among them, sometimes on a 10 to 1 proportion. I guess players should consider themselves lucky that altitude isn’t an issue, like it would be in Peru or Bolivia. Seriously, I think the World Health Organisation should hold a Worst Practices Conferences in tandem with the next World Cup.